I hit the red button on my mobile phone, dumped the shopping trolley and ran for the supermarket exit. I'd just taken a call from a source telling me that the American businessman Bill Miller was pulling out of his bid to buy Rangers. I knew the call was an instant end to a rare day off. Thirty minutes later I was showered, shaved and more than a little out of breath, standing in the BBC Scotland news studio. It was becoming the norm: the biggest story in Scottish football history was putting an end to days off for journalists across the country; but few were complaining. When the news broke that Rangers were calling in the administrators, it was far from a surprise but there was still a sense of shock in the sports news office. Administration stories had been covered in the past but this was Rangers. 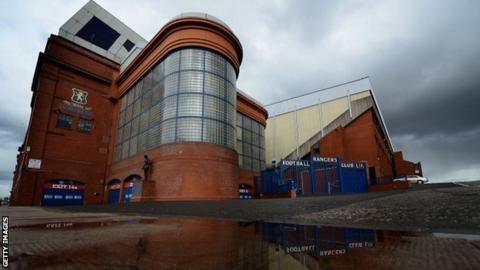 This was very different: despite the club's new owner's bullish rhetoric, it was clear that all was far from well inside Ibrox. The confirmation cemented the foundations of a saga that was full of twists and is still without end. It was a football fan's nightmare, but a sports journalist's dream. What set the Rangers administration story apart was the level of interest. It was no longer a sports story but very much a lead news story. The club crest spent more time on the front of newspapers over the year than the back - and so it was for broadcasters too. At our morning news meetings, I was to become a regular feature: quickly becoming a cross between a sports reporter and an insolvency correspondent. Administration; liquidation; Company Voluntary Arrangements; creditor reports; it all became common parlance when covering the Rangers story. Language, that, weeks before would've been the sole property of our business team. It was a daunting prospect. What the fans didn't see was the fight behind-the-scenes for their public support. The administrators Duff and Phelps came under fire almost immediately. Critics accused them of dithering and delaying the process - of not being decisive enough; of secretly working for Craig Whyte. They fought back quickly, becoming unusually accessible to the media and adept at off-the-record briefings through their public relations team. Prospective owners were briefing and counter-briefing too; jockeying for position and doing their best to convince the fans, through the media, that they were the answer to their desperate prayers. And thanks to the explosion of social media, and Twitter in particular, the battle was being fought around the clock with eager spectators more than willing to air their feelings. For the journalists, it was exciting but dangerous territory. An excellent way of getting stories out quickly but in terms of source, it was a case of 'proceed with caution'. My hair may be thinning but thankfully I've always been blessed with a thick skin. On a wet May morning, the Scottish media gathered at Murray Park to meet the new owner. The Blue Knights had come and gone, Bill Miller had looked in and left and Bill Ng had long since given up. My first sight of Charles Green was in the Murray Park media room. The journalists and cameramen had gathered but it was still about 15 minutes before the conference was due to begin. Green wandered in looking lost: everyone looked at each other before he was ushered out by a flustered press officer to prepare for his grand entrance. When it came, he was very much the no-nonsense Yorkshireman. His sound-bites were impressive and humorous and he was keen to portray himself and his consortium as the only show in town. Like many of my colleagues, I left wondering if he could pull it off. The circus that followed was as spectacular as it was bizarre. I covered the Rangers fans' march on Hampden after the Scottish Football Association had imposed a transfer ban; it was a strange day. There was obvious anger towards the authorities but also towards sections of the media. I interviewed a number of supporters who were convinced there was a conspiracy to kick the club as it lay wounded. Their stance hardened further after the top clubs voted against the newco club's admission to the Scottish Premier League and they took their place in Division Three. Deep divisions were opening up. From a media viewpoint, Rangers' fate was sealed after weeks of standing on the steps of Hampden waiting for sound-bites from chairman who seemed as perplexed by the whole situation as the journalists. Clubs were split as to what should happen to Rangers, but so too were the journalists. Away from the microphones and the keyboards though, debates took place as we waited for the Hampden meetings to end. Passion can sit alongside professionalism, despite what many think. The appetite for daily updates dwindled as the months passed, but the story refused to go away. I sought out and interviewed the former owner Craig Whyte; some argued that he should not have been given a platform. I disagreed. He was one of the main players in the biggest story in the history of Scottish football and he had left many questions unanswered. I spoke to the club before airing the interview to give them right of reply on a number of allegations. Charles Green was less than impressed by Whyte's claims that he brought the chief executive to the table. One year on and it's all change at Ibrox: a sense of normality has resumed and the players and fans are settling down to life in the Scottish Football League. That normality has also found its way back into newsrooms across the country. The saga no longer leads the news bulletins on a nightly basis; sports journalists are getting back to talking about sport. The debris from the whirlwind remains, though, and will probably take some time to clear. The wounds left by the storm will also take time to heal. The game has been left bruised and battered along with those who told the tale.